Since the peace of the strong has not rolled, can that of the weak work? Balancing over the abyss under fire, often literal, is part of the life of any Middle Eastern leader, including those in Israel, the only democracy in the region. But there is something unique about the perfect storm that haunts all those who have something to do, even if it is against their will, when Donald Trump presents the proposed peace agreement he ordered from his son-in-law and adviser, Jared Kushner. 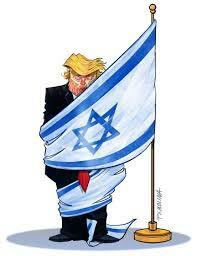 Trummy domestic politics, investigations into suspected corruption or misuse of function, old age and even the system of permanent chaos created by Trump for himself, Israelis, Palestinians and Americans live in different states of precariousness. In an attempt to sabotage the proposal that has not yet been publicly presented, Saeb Erekat, one of many who aspire to lead the future independent Palestine, has already said that the agreement is unacceptable. The right to kick is understandable. In a position of permanent weakness, leaders of the Palestinian Authority, the sphere of influence where Erekat and the like operate, would have to accept worse proposals than those rejected in the past. The clearest example is Jerusalem. In the 2000 negotiations, the Palestinians would have their capital in the eastern part of the holy city and control over the Esplanade of the Mosques, venerated as the Temple Mount by religious Jews and also secularists for being the land where the two biblical temples existed. Yasser Arafat rejected the proposal because Israel would retain control over a kind of belt around the Esplanade for security reasons. Who tells the story is Bill Clinton, the president who did not get the permanent peace that Trump now wants to promote. According to the proposal anticipated by Erekat, the Kushner plan foresees a Palestinian capital in the periphery of Jerusalem. It may be a move to open the negotiations with the lowest bid, but it exemplifies how the Palestinians lost political strength, especially because of the major changes in the Arab countries that were involved in the cause. Other important points are the permanence of some areas in practice annexed by Israel in exchange for the return of others and the creation of a corridor linking Gaza and the territories of the Palestinian Authority. The practically helpless question of the Palestinians who fled or were expelled to other countries would be discussed later. Making concessions, according to the basic rules of politics, is for the strong. Weak leaders or governments are afraid to appear more exposed even if they give in to important or unpopular points. Mahmoud Abbas, the Palestinian president, does not need to submit to inconveniences like regular elections, but would certainly have enormous resistance among the internal public. You are 82 years old and you will not get any younger. There are several candidates for succession counting the time - one in exile, one in jail and many in their surroundings. It could also have a sudden illness, if we want to join the conspiracy that until now surrounds the death of Arafat. Benjamin Netanyahu, the Israeli prime minister, faces three corruption inquiries. The most complicated involves a large telecommunications company, owner of a news site that has been very willing to promote the prime minister. By an incredible coincidence, there were amicable bills in relation to the company. The similarities with a country we know very well include award-winning donations from former prime minister aides with devastating potential. The wives of the main accused, Netanyahu and millionaire Shaul Elovitch, owner of Bezeq, the privatized state-owned telephone company, are also being investigated. "I thought we had talked about it. I can not go on, "says Sara Netanyahu in a message to Iris Elovitch demanding the head of Walla's editorial director for something she did not like. The message leaked to the press. Former Israeli army special forces with infiltration missions behind enemy lines - which in Israel sometimes means only a few kilometers - Netanyahu is also an expert on political survival. He is a year and eight months from becoming the prime minister with more time in the position, surpassing the father of the homeland David Ben Gurion. He continues to have much support from the base of his Likud party, which would lose only one deputy if the election were today. But it is not and the weather may be unfavorable to Netanyahu. If they smell blood on the water, loyal allies will become infidels, as is the practice of politics. More surreal is the situation of Jared Kushner, or "Mr. Perfect, "as the inner enemies say, the handsome, young, millionaire husband of Ivanka Trump. In charge of a difficult task like the peace between Israelis and Palestinians and placed in the impossible position of son-in-law and adviser of Trump, Kushner fell in the orbit of the special promoter Robert Mueller. Meetings with American and foreign business leaders who appear to be matched by loans to the Kushner family real estate empire have not improved their situation. But nothing compares to the leak that Trump asked his Home Secretary John Kelly to persuade his daughter and son-in-law, the Javanka, to leave the government they should never have gone back to New York. Two centuries ago, the European powers came together to discuss the "peace of the forts," the order that should reign after Napoleon's fall. Emperors, kings, princes, and diplomats discussed daunting questions. In political-territorial terms: the configuration of the German states in a new confederation in place of the Holy German Empire, the reorganization of Central Europe and Italy, the reshaping of the Scandinavians and a new partition of Poland. Branches of the royal house of Bourbon assumed the monarchy restored in France, Spain and the kingdom of Naples. River navigation, abolition of the slave trade were other themes of the Vienna Congress. In the midst of all this, Napoleon fled from Elba and returned to the brief Hundred Days, the adventure ended with the defeat at Waterloo. Peace and order decided by the forts - Great Britain, Russia, Prussia and Austria - lasted until 1914. Given the reach of the Vienna Congress, an agreement between Israelis and Palestinians does not seem absurd, especially since it has to be based on an already existing reality of tacit alliance of countries like Egypt and Saudi Arabia with Israel. Palestinians deserve to have national rights, including dignity, even if their country does not come as they want. Israel deserves the recognition of its immediate neighbors. Trump may well deserve the deliciously ironic title of peacemaker sought by so many American presidents before him. And Jared Kushner deserves to go back to New York.